Over 200 members and guests battled the snow and ice to join us once again from all over Ireland for our R&D Tax Credits and Knowledge Development Box seminar. Hardly surprising given the very ‘hot’ nature of both of these topics! We were delighted to be joined by Brian Boyle of the Revenue Commissioners who was responsible for the recent set of Revised Guidelines in relation to the R&D Tax Credit. Published in January 2015, he took the time to explain the revisions introduced, and answered many questions from our enthusiastic audience. 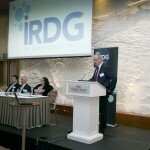 He was joined for the R&D Tax Credit set by Christine Kelly of IDA, and also Tony O’Donnell of SAP. It was great to see how SAP have developed their own internal processes to ensure they are compliant and prepared for Audit – a useful set of ideas for any company to implement. Following the coffee we got our first insight into the proposed Knowledge Development Box. Cora O’Brien of the Irish Tax Institute and Fred Logue of New Morning IP took us through the proposals, including the European / OECD perspective. The Irish consultation process is underway until April, and the panel of speakers was then joined by Mairéad Ross of the Department of Finance who is involved in that project. There was very lively debate and Q&A, and clearly there are considerable opportunities for companies to input to the consultation. It is vital that businesses do make their thoughts known as the current proposals appear to omit forms of IP that are widely used within industry. The opportunity to try and influence the final result is now. IRDG members who wish to submit to the consultation process may do so on an independent basis, or alternatively through ourselves. IRDG has a Working Group in place at the moment developing our submission on the Knowledge Development Box, and this group would welcome input from right across the membership. Please contact Denis Hayes or Mary Byrne to have your say. Copy of Presentations from the seminar are available to IRDG Members in the private members area of our website. Click here to login.